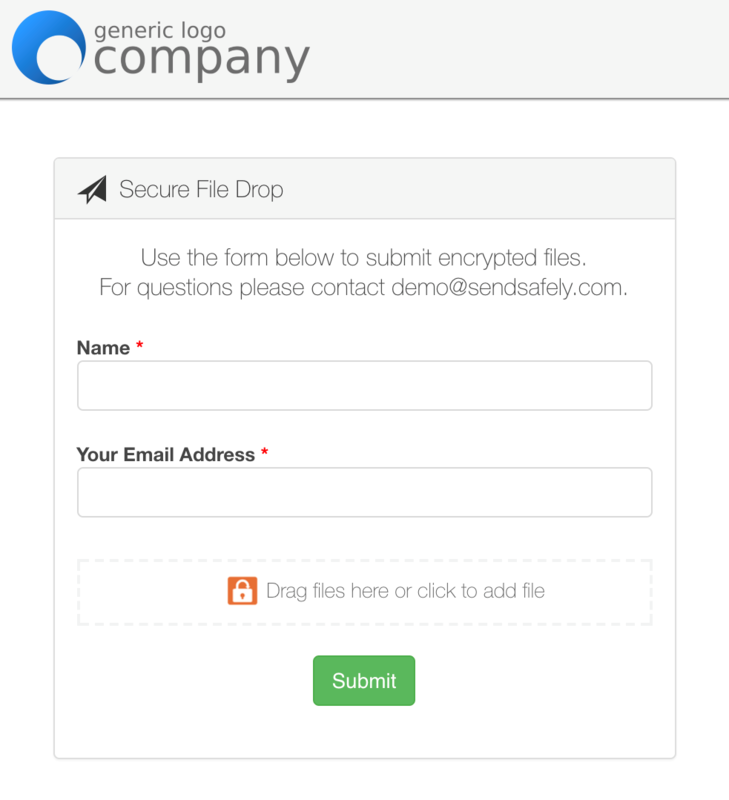 The SendSafely Dropzone can be used to integrate best in class, end-to-end encrypted file transfer capabilities with the applications you and your customers already use and love. We developed the Dropzone so that you can leverage best of breed online apps while being able to securely collect sensitive files from customers. Dropzone Connector - Connect our Dropzone Widget to other platforms, like Desk, Salesforce, Zendesk and Zapier. Our Dropzone Connector for Zapier lets you integrate the Dropzone to over 750+ popular third party apps like Slack, Asana, and more. Dropzone Apps - Native Dropzone apps for Salesforce and Zendesk allow your agents to access securely uploaded files seamlessly within their native interface. Dropzone Developer API -Automatically download and retrieve inbound files for use within any proprietary business process. The sky is the limit for custom implementations. In this blog post, we'll take a look at how you can use the Dropzone Widget and Dropzone Connector to connect inbound secure file transfers to popular third party apps. The Dropzone Widget is a turn-key file drop that can be used by anyone, anywhere to submit files securely. The widget can be embedded into any existing website, and we also offer a hosted version that can be automatically enabled and runs within the SendSafely web portal. For Enterprise users, the Hosted Dropzone is white labeled with your company’s logo and custom color scheme, providing a consistent look and feel for customers and business partners. With the Hosted Dropzone Widget, there is no coding or setup required. The Embedded Dropzone Widget provides the same capabilities as our Hosted Dropzone but can be integrated directly into your own web form, providing a completely customized experience for your users. 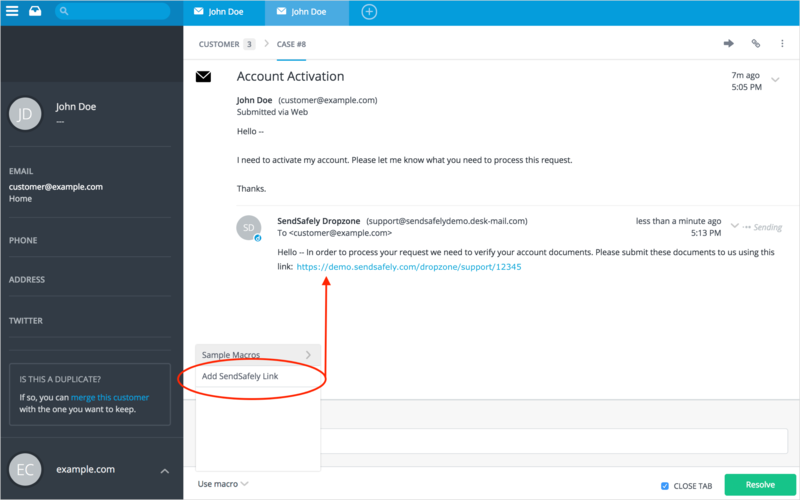 From your SendSafely Edit Profile screen, you control who has access to inbound files and how long those files will remain available before they are automatically deleted. You can also restrict the allowable file extensions. If using our Hosted Dropzone, you can customize the form input label to request any custom value from the user in addition to their email address. Our notification settings also let you control how recipients are notified, or whether a custom webhook (such as a published Dropzone Connector) should be used for notifications instead. Our Dropzone Connectors allows you to extend your Hosted Dropzone to integrate with virtually any third-party platform. SendSafely has pre-built Dropzone Connectors for Zendesk, SalesForce and Desk.com that run on Google Scripts, and a web hook app for Zapier that can be used to connect the Dropzone to over 1000 other platforms. 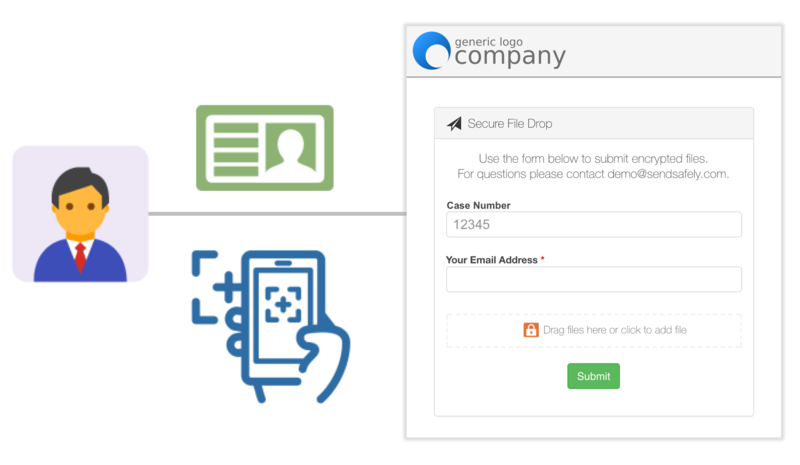 The Dropzone Connectors each use a custom lookup field which is used to associate inbound files with the appropriate record in the connected system, like a case number in Desk.com. This value can either be entered by the customer at the time of file submission, or, more commonly, embedded in the Dropzone URL provided to the customer as shown below. Your customer uses the Dropzone to submit their files. Note that the Case Number field is labeled and automatically populated since the agent included the case number in the URL. The Dropzone page works natively on all modern web browsers and mobile devices, and can attach images directly from any mobile camera. Once the form is submitted, the Dropzone Connector is used to post the secure link to the appropriate record in the connected system, in this case the specified Desk.com Case Number. The connector also supports validating information on the connected record, such as confirming that the submitter’s email address matches the owner of the specified Desk.com case. 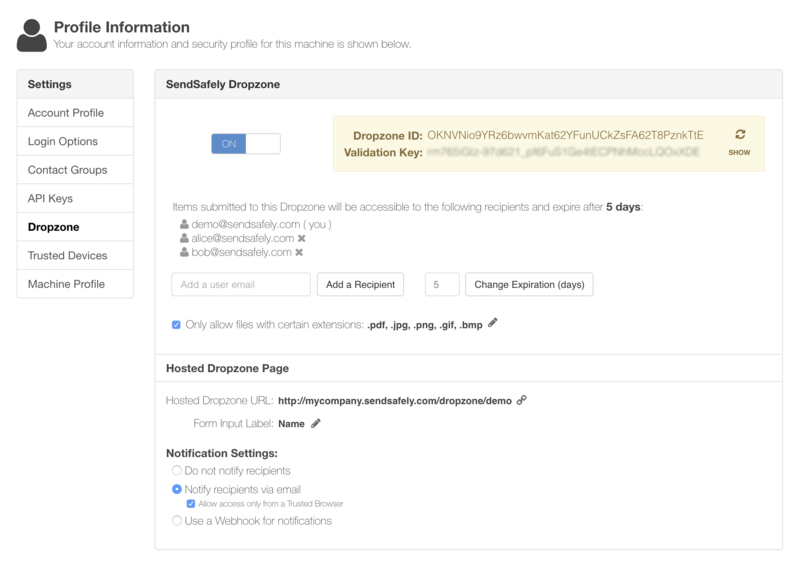 Once published, your Dropzone Connector can be enabled by providing the web hook URL in the Notification Settings for your Hosted Dropzone page. For a list of available Dropzone Connectors for Google Scripts, or to request beta access to our Zapier App, contact our Support Team. A downloadable data sheet on the entire Dropzone Suite can be found here.